My last article discussed a number of unhealthy reasons to forge a romantic relationship. Many of the same intentions often serve as motivations for people to stay in a bad relationship when they should cut their ties and move on. It could be that we entered into a partnership based on an unhealthy reason. However, your relationship could have begun for all the right reasons, but now it has gone sour and is no longer fulfilling, or mutually beneficial. Let’s review some of the top motivators that might be the reason you’re staying in a relationship that has clearly run its course. The fear of being alone is a significant driver for many people to remain in a relationship that no longer serves them. They would much rather have the company of their partner, even if they fight or stonewall one another, than face the possibility of being alone. There is also apprehension of the unknown once they leave a relationship, especially if it has been long-term. Many people erroneously believe that staying with a selfish, boring, abusive person or someone who is simply the wrong partner for you is better than being alone. What we need to clearly understand is that when we are in an unhealthy relationship, or even one that isn’t working out, we are actually already lonely. By breaking our ties in a kind, mature manner, we allow ourselves (and our partner) to heal, reflect, and at some point, possibly find someone who is a better fit. Many of us feel obliged to stay in a marriage or relationship based on pressure from family, friends, or even our religions, which often influence us unduly by warning that our reputation and image will be tarnished (possibly irreparably) if we divorce or terminate a partnership. Our imagined obligations to others, or our attempts to meet the expectations of others, is NEVER a valid reason to remain in any relationship. Period. We each need to evaluate our relationship and our needs, without paying too much attention to what others think or expect. For many people, especially women, financial security is a huge motivation for remaining in a relationship that’s no longer beneficial. If your partner is the primary breadwinner, how will you possibly be able to manage on your own without his/her income? You might fear losing your home, being unable to make ends meet, or even losing your children if you are unable to adequately provide for them. It’s best for you to get control of your financial situation when you are single. That way, you will be an equal partner regarding dealing with financial matters in a relationship. However, when a relationship becomes irreparable, you may need to resign yourself temporarily to a lower standard of living, in order to start your new chapter. You may likely have to make necessary trade-offs and compromises in order to secure one’s independence. Ask yourself, however: isn’t it better to live in a more modest home without an abusive partner than to live in a mansion devoid of love, kindness, and respect? Isn’t it better to find an environment that is more peaceful and safer for your children? With determination, support from family and friends, and a positive attitude, you can begin to create a better life for yourself and provide for your own necessities. Fear of the unknown can seem greater than staying in a dead-end relationship; but having the courage to move forward toward achieving financial independence and ultimate peace of mind is surely a step in the right direction. Ending a relationship often brings anxiety about our new, changed social status, being excluded from social engagements, and losing mutual friends. In hard times, your true friends will stand beside you, offering support, understanding, and unconditional love. Those so-called “friends” who fell by the wayside were fair-weather friends; you are better off without them. This even includes your partner’s family members. People who are objective and mature can, and will, weather the storm of your breakup. Social status is important to many, but it never warrants remaining in a relationship that is unhealthy, has run its course, or is in any way abusive. Many people, especially those who have been in a relationship for many years, are concerned that they will not be able to find a new partner. This fear tends to be a concern for women who think that they are no longer “young and desirable” and because of their age, believe no one will be interested in them romantically. Fear is never a valid reason on which to base any decision, including staying in a relationship that isn’t right. Just because we age does not mean we are fundamentally unlovable or less desirable. Remaining in a loveless relationship leads to our being alone and miserable. By letting go and moving on, we can open ourselves up to meeting new people and perhaps finding the right partner. You think your partner will change– We can’t change someone else. This holds true for annoying little habits like leaving a wet towel on the bathroom floor, to bigger issues like poor communication, substance abuse, infidelity, and being a workaholic. The only thing that will change is what you choose to change about yourself. This isn’t to give carte blanche to abruptly end a relationship just for annoying little habits. I definitely encourage open, thoughtful communication with your partner to attempt to resolve issues that threaten your relationship, but if you’ve explored all possible avenues and those issues still remain, it is probably time to move on. Many of us, both men and women, choose to stay in a bad relationship “for the kids.” We fear that divorce, or ending our relationship, will irrevocably damage our children. But it’s even more important to consider what staying in an unhealthy partnership will do to our kids. It is very probable that they will be exposed to arguments and fights, seething anger, mutual disrespect, and contemptuous communication. You are not doing your kids any favors by “hanging in there” when your relationship has disintegrated. It is much healthier for your children to have two happy, healthy parents who no longer live together than two parents who are miserable yet stay together out of misplaced loyalty. Relationships are never easy. They take commitment and work by both parties. There are definitely times to remain in an unhealthy relationship and work as a couple to resolve issues, but sometimes people stay in a dead-end relationship purely out of fear and misplaced obligation. 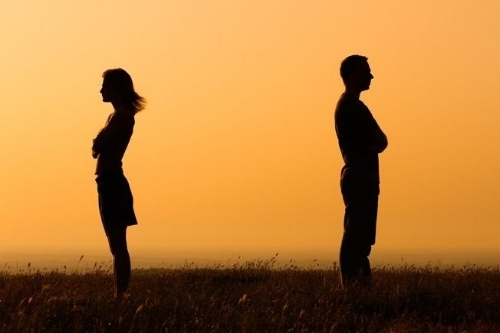 Ending a relationship is always hard, but sometimes it is best for both involved. It is entirely possible to move on, learn, grow, and even find a new romantic partner. Note: Any relationship where your partner is mentally, emotionally, or physically abusive is cause for concern, is fundamentally unhealthy and, quite possibly, unsafe. Very often, those being abused become immune and numb to their mistreatment. Many are afraid to leave. Others convince themselves that they are somehow deserving of their partner’s physical or mental/emotional wrath, and slowly adapt to a “new normal,” where this clear mistreatment is somehow accepted. If you are in an abusive relationship, I strongly encourage you to seek help and support from those you trust. This relationship will not end well, as your partner will not change. No matter how frightening it may be to leave, you (and your children) will be much better off away from this damaging, possibly dangerous person. You are worthy and deserve a healthy, happy, loving relationship.